Laurie Kirszner and Stephen Mandell, authors with thirty years of experience teaching college writing, know what works in the classroom and have a knack for picking just the right readings. 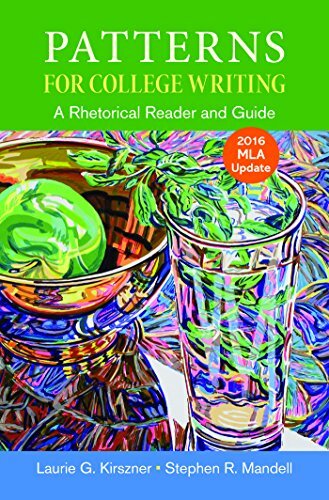 In Patterns for College Writing, they provide students with exemplary rhetorical models and instructors with class-tested selections that balance classic and contemporary essays. Along with more examples of student writing than any other reader, Patterns has the most comprehensive coverage of active reading, research, and the writing process, with a five-chapter mini-rhetoric; the clearest explanations of the patterns of development; the most thorough apparatus of any rhetorical reader; and the most comprehensive coverage of argumentative writing―all reasons why Patterns for College Writing is the best-selling reader in the country. And the new edition includes exciting new readings, images, and debate and casebook topics. If you have any questions about this product by Kirszner Laurie G, contact us by completing and submitting the form below. If you are looking for a specif part number, please include it with your message.